Saturday morning joggers huff and puff as they rattle along the Parkland Walk – the capital’s longest nature reserve – in north London. But once it was trains that let off steam on this urban, yet green, route connecting Highgate and Finsbury Park (there is also a northern section, that didn’t walk, continuing north to Alexandra Palace). Used first by the Great Northern Railway from 1867 and last used by trains in the 1970s, abandoned platforms, towering bridges and a former station house can be seen by walkers, joggers and cyclists who pass along the broad path covered for the most part by trees across its width. The London Underground had planned in the 1930s to electrify the line and incorporate it into the Northern Line, but the project was halted by the Second World War. By that stage however a considerable amount work had been done, including the construction of new platforms (which can still be seen) at Highgate. It was closed to passengers in 1954, but some freight trains used it until the 1970s. There was then some debate as to what should happen to the route and various housing schemes were proposed. But a public enquiry in 1979 rejected these and it was said that as an open space it “had a value extending far beyond that of local interest…. warranting special protection” and that the development for housing “would prevent the benefit of rare environmental contribution being realised”. The tracks were lifted and work began to turn the space into a nature reserve. 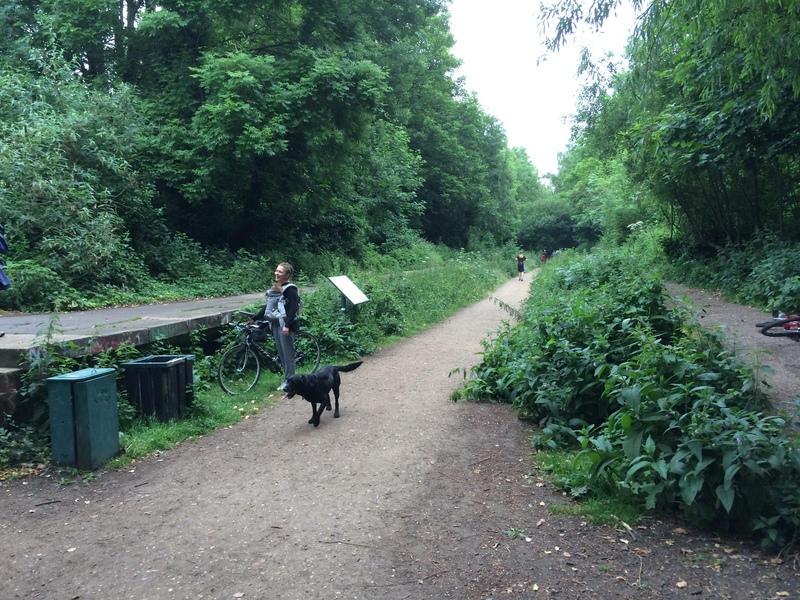 It officially became the Parkland Walk in 1994 after efforts to improve the paths. There are said to be some 250 plants along its length, along with much other wildlife. Later on, things become more open and on either side you overlook the back gardens of terraced houses. 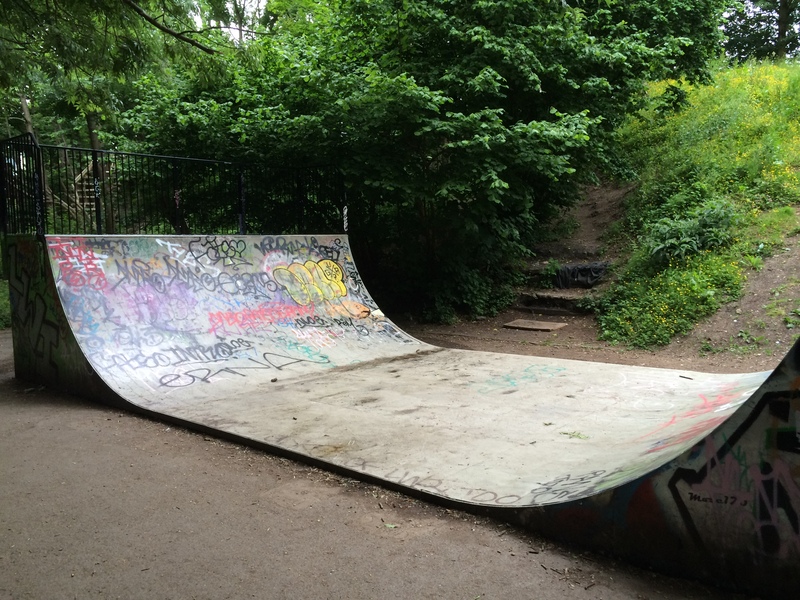 There is even an adventure playground with rope slides and a skateboard ramp at one point. It is also a colourful route in the sense that many walls are painted with graffiti. 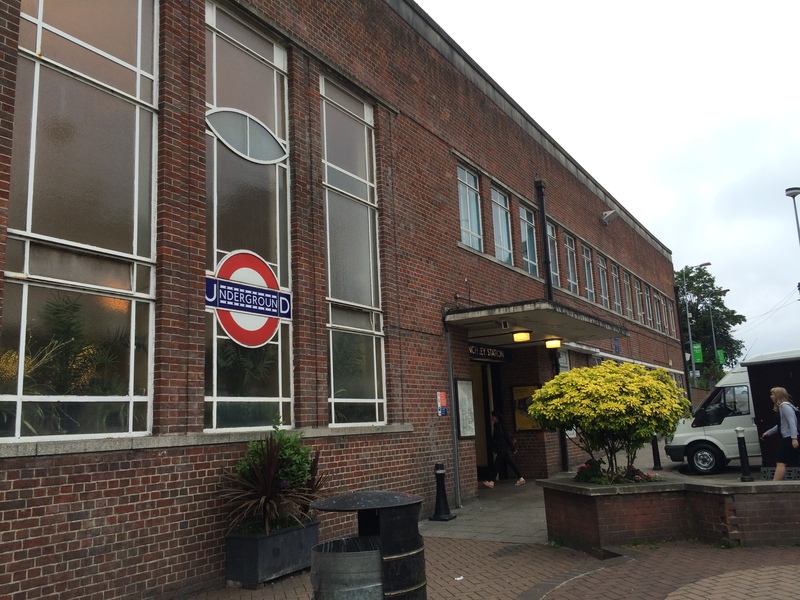 My walk – the final leg of my Capital Ring adventure – had started at East Finchley Underground station. This Art Deco building designed by Charles Holden replaced a station constructed by the Great Northern Railway in 1867. Looking up from the platforms, you can’t miss a three-metre tall statue by Eric Aumonier of a kneeling arching, posing as if he has just fired an arrow in the direction of central London. He is there to commemorate the area’s historic association with hunting in the nearby Royal Forest of Enfield. While Underground services never started on what is now the Parkland Route, they began running on this line in 1939. If you are travelling up the Northern Line from the south, East Finchley is the first time you see daylight. As part of the 1930s rebuild, two additional platforms were constructed at new station, giving four in total. The idea was that trains would have been able to run south from East Finchley via two routes, as part of the “Northern Heights” project (an excellent video from 2009 details other sections of the scheme). One branch was planned to run underground via newly constructed tunnels to a new deep-level Highgate station (this was fulfilled and is today used by Northern Line trains). The other would have run over existing over ground tracks (which are now derelict) to Highgate station before embarking on the route of what is now the Parkland Walk to Finsbury Park (as I’ve already described, construction of this was halted by the Second World War and never re-started). To get to the Parkland Walk, from the bustling high street of East Finchley I headed through a series of forests with wide pathways and tall trees. I passed through Cherry Tree Wood fairly quickly, but neighbouring Highgate Wood is much bigger, stretching for some 28 hectares and is now owned by the City of London. The woodland, consisting mainly of hornbeam coppice and oak standard trees, is said to date back to the last ice age and would once have been part of the vast Ancient Forest of Middlesex. It was later part of the Bishop of London’s Hunting Park. I then went to Queen’s Wood Nature Reserve, which has a charming little café set in a woodland lodge. Outside, volunteers were selling plants. 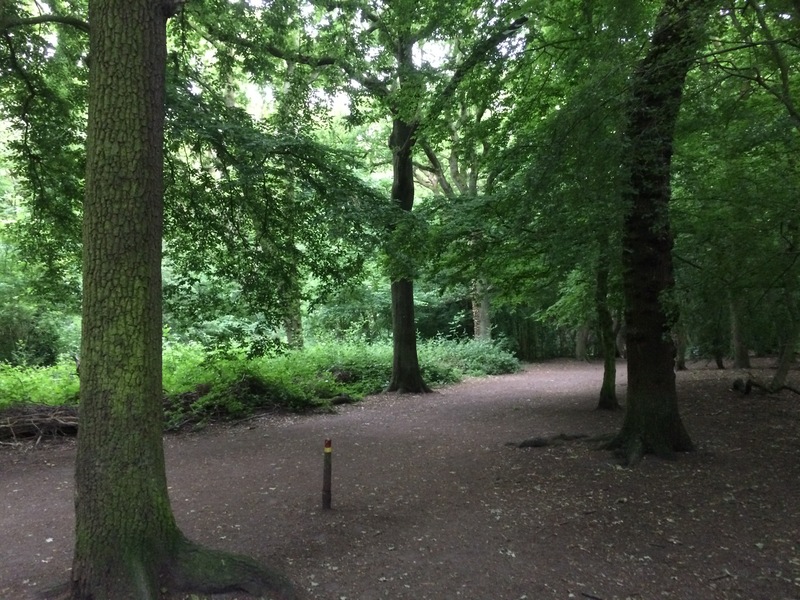 It was previously known as Churchyard Bottom Wood until it was bought by Hornsey Urban District Council and renamed Queen’s Wood in honour of Queen Victoria. Today, the different components of the much bigger area of historic forest are separated by roads and housing. But despite these modern intrusions, the sound of traffic quickly disappears after just a few minutes inside these public park and you feel a long way from bustling London. The Parkland Walk starts a short hop from Highgate Underground station and then connects with the open space of Finsbury Park via a pedestrian footbridge over a spread of railway lines that carry trains to the north of England. I’ve visited and written about this latter area in detail before, but still always enjoy heading back there to enjoy the open field, boating lake and well-kept ornamental gardens. Pleasingly, the New River along the edge of Finsbury Park and the Capital Ring follows the bank of this river up right up to where it flows into the East Reservoir, near Clissold Park. This 40 mile artificial waterway was completed in 1613 to bring fresh water from springs in Hertfordshire to Islington. There was considerable opposition to the scheme from local landowners and it became a very expensive project, but King James I helped entrepreneur Sir Hugh Myddleton ensure it was completed. The river still supplies water to London, but some sections seem better looked after than others. At one point I had to climb over a locked gate to progress on the Capital Ring route. Perhaps, Thames Water don’t want people to see a section of water that’s strewn with rubbish. Things improved as I got closer to East Reservoir (and adjoining West Reservoir), where for a short section the New River runs in parallel to this vast expanse of water that is now used for watersports. Minutes earlier I’d passed industrial building and, but now my route took me passed luxury apartments on the water’s edge. There’s so much regeneration going on here right now. After a short stretch walking along a busy main road, I found a section of water that was once part of the New River in Clissold Park. The centre piece of this park is Clissold House, which was built in the 1790s for Quaker Jonathan Hoare and is now partly used for a wonderful cafe with an outside terrace overlooking the park. I walked around the grounds, which include a playground, tennis courts and two small lakes, the latter named after Joseph Beck and John Runtz, the two people who persuaded the Metropolitan Board of Works to buy the land and open it up to the public (that happened in 1889) as a park that all could enjoy. I enjoyed a coffee at the café before jumping on a train at nearby Stoke Newington station. I was now just a few miles away from the end of my Capital Ring walking adventure. My trip along the Capital Ring concludes next Thursday on Pastinthepresent.net when I walk from Stoke Newington to Hackney Wick. If you have missed any installments from my trek, you can read all the articles that have been published so far here.